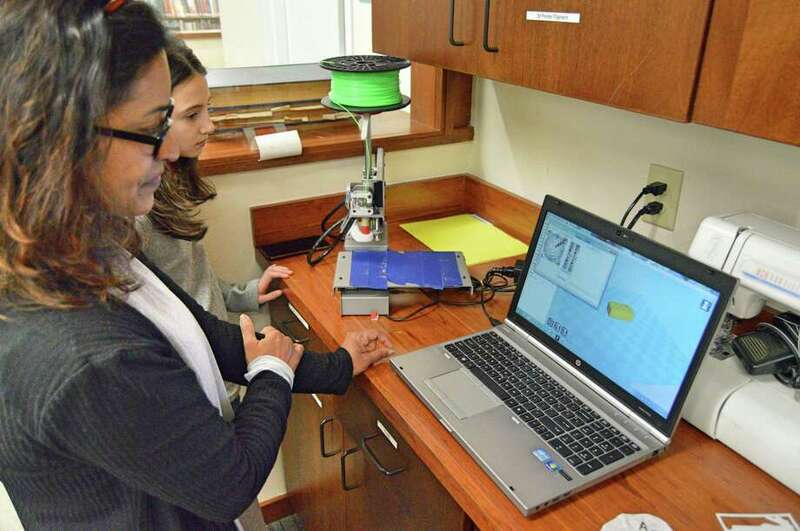 Children's library assistant Sheela Bhatia works with children on the 3D printer during the STEM program at Weston Public Library on Feb. 10, 2019. WESTON — There is a world of activities for children to explore at the Weston Public Library. There are movie nights, arts and crafts, games, story time, and even a Harry Potter Club. But one activity growing in popularity is the library’s new STEM program. That’s where a group of children recently spent their Sunday afternoon, building inventions, robots and learning skills along the way. “Each week this program is filled with a wait-list,” said children’s librarian Alessandra Petrino. The library’s STEM (science, technology, engineering, and mathematics) program started a few months ago for children ages 8 and up. Kids ages 5 and up are allowed but must be accompanied by a parent or guardian. Each week there are different projects to choose from, including Ozobot, a 3D printer and Littlebits. The classes typically are the first two Sundays of the month and are limited to eight kids due to the size of the maker space. During this particular session on Feb. 10, children occupied each corner of the room to play, create and share. One group played with Littlebits, a system of electronic building blocks, while another worked with Ozobot, pocket-sized coding robots. At another corner of the room, a few children set up paper towel rolls as a slide and taped them around different areas of the space. The objective: to get a ping-pong ball to easily roll down the course. On the counter of the maker space sat a 3D printer hooked up to a laptop, donated by students at Weston High School who originally designed and created it. STEM education has become popular among school districts in recent years, and public libraries like Weston’s have jumped on the trend. “We would love to have a secondary state-of-the-art printer; it would be nice,” children’s library assistant Sheela Bhatia said. Bhatia led the STEM activities for the day and often runs the program twice a month. Originally it was every Sunday, but due to staff limitations, it had to be scaled back. “It is something wonderful that we get to offer the kids,” she said.